From the very first glance, either online or in person, potential buyers should immediately be hooked and feel like it is already their home. Most homeowners rarely go through their own front entry, so take some time to enter though your front entry and view it as if you were seeing it for the first time. Prospective buyers will notice every detail and determine whether or not they are interested in your property. 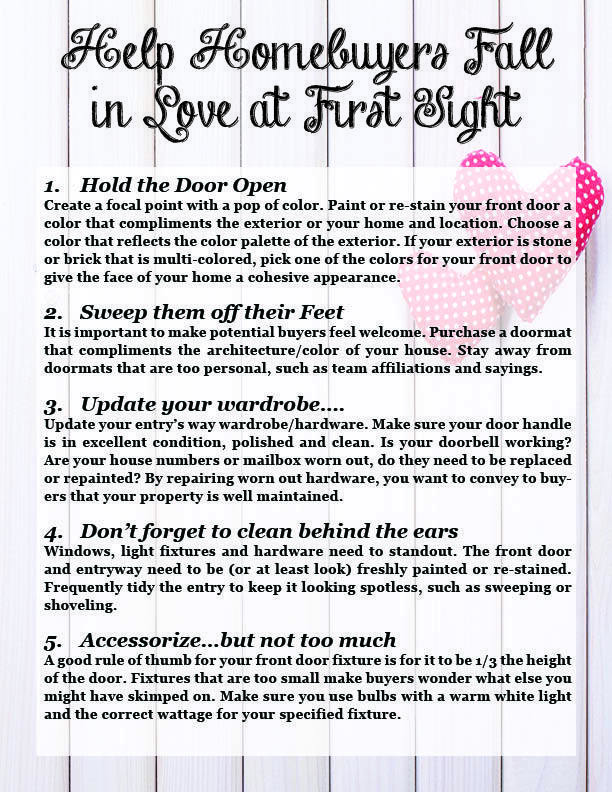 Here are 5 home staging tips to increase your curb appeal and help home buyers fall in love with your home. AskHomesale.com provides real estate advise and information for home buyers, home sellers, and homeowners alike. Askhomesale.com is part of the Homesale Realty Family. The Homesale Family of Companies is the leading real estate company serving the Baltimore, Maryland, South Central and Southeastern PA real estate markets. Homesale Realty has more than 25 offices with over 1,000 REALTORS®. Homesale Realty’s footprint includes Maryland real estate offices inBaltimore City, Federal Hill, Fells Point, Westminster, and Timonium. Pennsylvania real estate offices include York, Lancaster, Wyomissing,Chambersburg,Gettysburg,Harrisburg, and Schuylkill Haven.